There are a large number of German First World War cemeteries in the Vosges area of the Western Front, many of them containing original features or even contemporary headstones. The cemetery at Illfurth, located on a hillside amongst the woods above the town, was a cemetery started by the Germans when this ground was part of Germany in 1914. At that time the men buried here would have been interred on what was perceived as home soil but post-war this area was returned to France as it had been taken from them following the Franco-Prussian War in 1871. 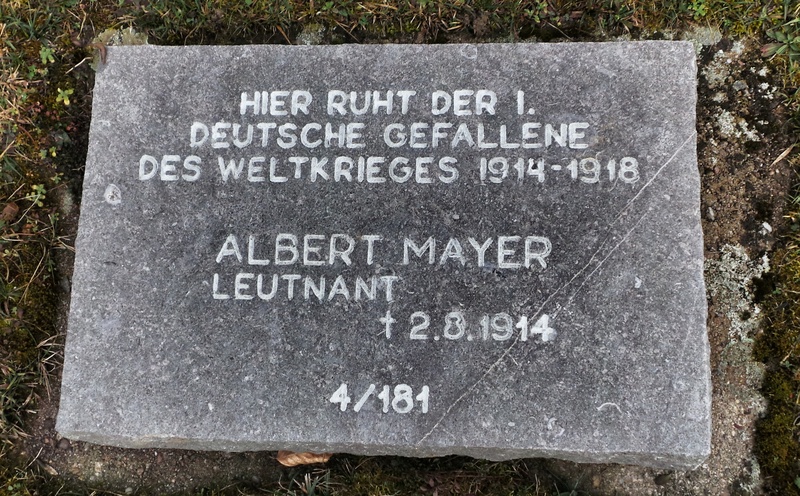 The cemetery has 1,964 burials and among them is Leutnant Albert Mayer who is recorded as being the first German battle casualty on the Western Front. He was killed near Joncherey on 2nd August 1914. Albert Mayer’s grave at Illfurth.